Goat Simulator: The GOATY is a complete version of Goat Simulator - an arcade game from Coffee Stain Studio. In addition to the basic version of the game, the release also includes all the add-ons that have been released in recent years. Goat Simulator: The GOATY is a complete edition of a humorous arcade game in which we play as a goat. 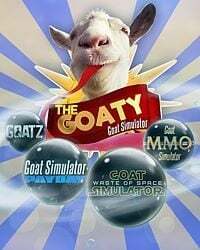 It includes the basic version of the Goat Simulator and four add-ons: MMO Simulator, PayDay, GoatZ and Waste of Space. The game was developed an released by Coffee Stain Studios. In Goat Simulator: The GOATY, we play as a goat named Pilgor. The aim of the game is to do as much damage as possible. Our main tool is the goat's tongue that can be attached to various objects. In order to increase the damage, the developers have also gave us an option to climb a ladder or ride a bicycle. Pilgor can also leave his original town to cause destruction in new places. The MMO Simulator expansion takes place in a fantasy world of the Lord of the Rings. Waste of Space takes place in space. Each add-on also offers new ways to cause destruction, such as firearms in GoatZ add-on, and more characters to choose from. In Goat Simulator: The GOATY you can play in single player mode and in cooperation with up to four people. Goat Simulator: The GOATY runs on Unreal Engine. The resulting realistic graphics intensify the game's absurdity.